Successfully Added Indoor HD IP Camera - 1/4-Inch CMOS, 720p, 10m Night Vision, Motion Detection, PTZ, App Support, WiFi Wireless, Two Way Audio to your Shopping Cart. With this compact indoor HD security camera, you’ll be able to keep track of all what’s happening inside your property. Equipped with a 1/4-Inch CMOS sensor, this IP camera puts forth crisp 720p HD footage. It even supports motion detection and 10m night vision. Thanks to this, you can be assured that not a single movement stays unnoticed within your property while you’re not around. 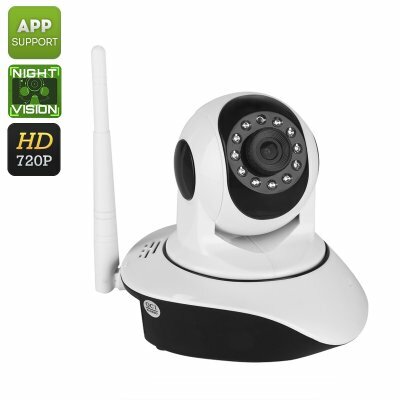 With its wireless design, this WiFi IP camera offers great efficiency and easy usage. Simply place it anywhere in your home or office and you’ll always be up to date on what’s going on within your walls. This HD IP camera supports the input of a 64GB SD card through which it allows you to instantly store recordings so that you can watch them back later on. With its built-in microphone, your indoor security camera is even capable of capturing voices. Additionally, it also supports a speaker that lets you talk to visitors or possible intruders from afar. With its App support for both iOS and Android phones, you’ll be able to access the live video stream of your IP camera at any given moment. To make sure that not a single corner of your room stays out of reach, this indoor IP camera supports PTZ control. It allows you to rotate your camera in a 355-degree angle horizontally and 120-degree angle vertically. Additionally, the lens itself features a 120-degree viewing angle. Thanks to all these features, you can be assured that there won’t be any blind spots within any room while using this compact security camera. Whether you use it as a simple nanny cam, or to protect your home or office – this compact IP camera is guaranteed to increase your security. I needed a wireless camera that did not require an Internet connection. I tried a Yi Home camera but they will not work without the internet. This camera works great. I have it connected to a router that has no internet connection and it's perfectly happy. The pan and tilt is great. It has a screw thing on the bottom for mounting and comes with a wall mount adapter. Nice! Picture quality is good. The wide angle lens covers most of a room. WiFi has a good range (better than the Yi Home). The camera is ONVIF compliant (which I never heard of before). That means you can use the supplied software or any other ONVIF software you want. A lot of it is free. You can also use rtsp for viewing. After some digging I found that the rtsp URL must end in /12 (ie rtsp://192.168.1.4/12). You can have the camera record on an SD card or onto a remote computer (which I have not tried). Motion detection works great. All in all a very versatile camera for a great price. I'll be buying a few more. It took a lot of screwing around to figure out how to use the included software to configure the camera. There are a lot of options. You can have it record at certain times or when it detects motion at certain times or do both at certain times, or do nothing! The recordings can go to the SD card or a remote computer via FTP. You can be alerted via email when there is motion detected. Eventually I got it to do what I wanted. My only real complaint, other than the steep learning curve, is that you can only transfer video's from the SD card to a computer one at a time (using the included software). But since the camera is ONVIF compliant there probably is other software that can copy more than one file at a time.